Unicorn marketers are made, not born. Unicorn marketers are rare -- so rare that I've only come across a few in the wild. Some of these unicorn marketers were consultants. Some were part of an in-house marketing team. A few of them were marketing executives. 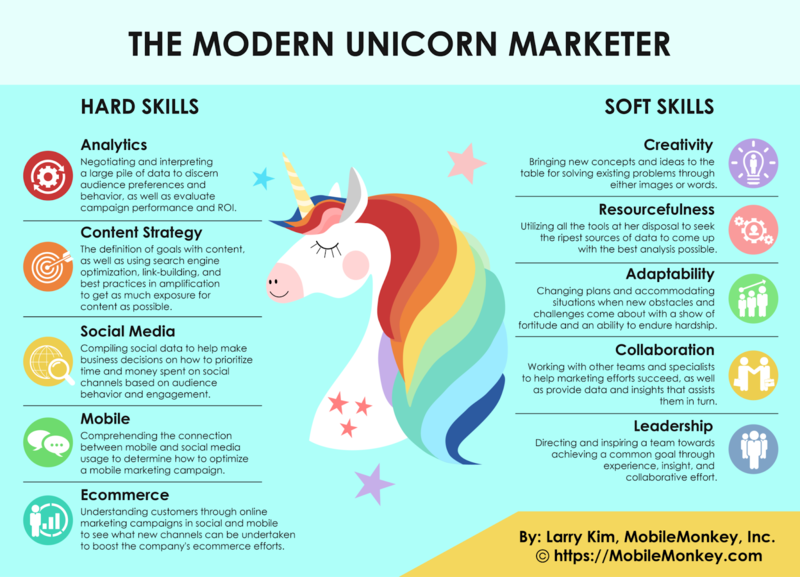 I've explained before that modern unicorn marketers have a blend of hard skills and soft skills. When I talk about unicorns people think I'm talking about magic. Only 2% of efforts get results -- and that 2% of results drives most of a company's clickthroughs, views, shares, conversion rates, and revenue. This 98% and 2% data isn't arbitrary, by the way. It's the result of relentless content testing that I did at my previous company. That 2% -- that's unicorn stuff. And that's what unicorn marketers believe is going to happen. Donkey marketers -- creatures that are content to hoe their row -- get siloed about their marketing. They think, "Okay, I'm an SEO. So I'll do SEO stuff. I'll optimize the metadata and alt-tag the images, that's what I'll do." But a unicorn marketer -- creatures that prance in fields and poop rainbows -- they don't see boundaries, don't hoe rows, and don't believe in silos. The donkey thinks, "But, wait, you can't do that. That's not really a thing, and I don't think ..."
The unicorn replies, "I'm going to try it anyway." I've seen unicorns do things that seemed absolutely stupid. But as you can probably guess, those were the things that got genius results. Heck, I'm personally taking a major gamble on Facebook messenger marketing right now, a marketing channel that didn't even exist a couple of years ago. Some unicorns have done things that could hardly be described as marketing. But results don't care about labels. And the not-sure-it's-even-marketing moves turned into millions of dollars in revenue for their companies. And, that's what really matters -- results. Unicorn marketers can be hard-headed. They're not into following rules or abiding by some playbook. Donkey marketers dot every i and cross every t, hoping that by following someone's rules, they will achieve marketing success. 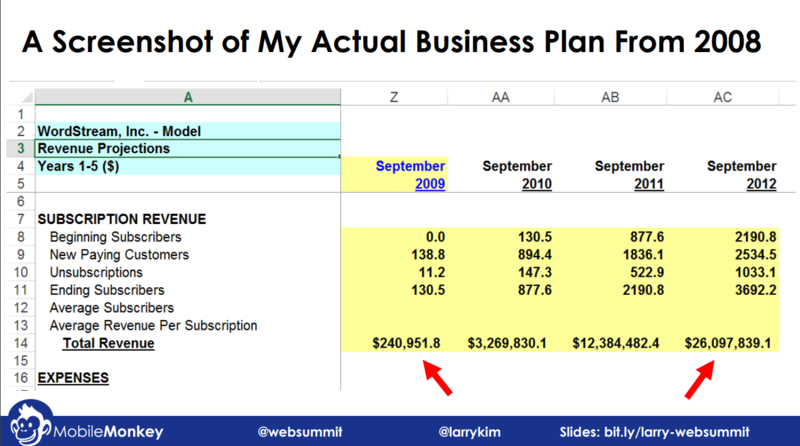 They measure success in terms of quantitative output -- 3 blogs per week. I don't care how smart you are. Eventually, something works. And that's the unicorn moment. It's the results that they've been angling for all this time. If following the rules isn't giving you results, write some new rules. It's not that unicorns spit on rulebooks and disparage boundaries. 4. Unicorn marketers repeat their unicorn moves until they stop working. If you're expecting results, trying everything, and addicted to results, then you will find your unicorn growth hack -- something that will blow up with eye-popping results. When you find that one thing, do it again. This is the way of the unicorn. Unicorns make unicorn babies. If a donkey marketer does something remarkable, there will be a round of high-fives and back-slaps, and then it's onto the next thing on the content calendar. Unicorn marketers, on the other hand, know they've unlocked a unicorn hack. And when they do, they double down on it. Turn it into an infographic. Make a video about it. Produce deep content on that single subject. Replicate the heck out of your unicorn hack as long as it keeps delivering results. 5. Unicorn marketers are just donkey marketers pretending to be unicorns. Here's the dirty secret that most unicorn marketers won't tell you. They're actually donkeys. And they're pretending to be unicorns. If you strap a unicorn horn onto a donkey, it sort of looks like a unicorn, right? A lot of unicorn marketers are strapping on their proverbial unicorn horns because it makes them look like a unicorn. Once they look the part, they act the part. It sounds cliche: Fake it till you make it. I did this in the early days of my first startup with a few simple and inexpensive hacks. Sure, my company didn't have the legacy of an IBM or the reputation of a Microsoft, but I knew how to read social media algorithms and generate real traffic to my company's content so we looked big. I pretended that my company was a unicorn by promoting our content to audiences in the millions. The massive awareness I achieved was the catalyst. It transmogrified a donkey into an actual unicorn. Real people, real clickthroughs, real conversions, and real revenue started pouring in, and I knew that the donkey act had produced a unicorn reality. Sometimes, acting like you are a unicorn is the best way to become one. The characteristics I described here can be learned, built, and formed through diligence, hard work, and time. Granted, this article is not about the tactical methods that unicorns use. It's about the mindset of a unicorn -- what they expect, how they try, why they obsess, and what they do to achieve unicorn status. I write it, think it, read it, or say it every day -- be a unicorn in a sea of donkeys. My hope is that I'll find more and more marketing unicorns in the wild.